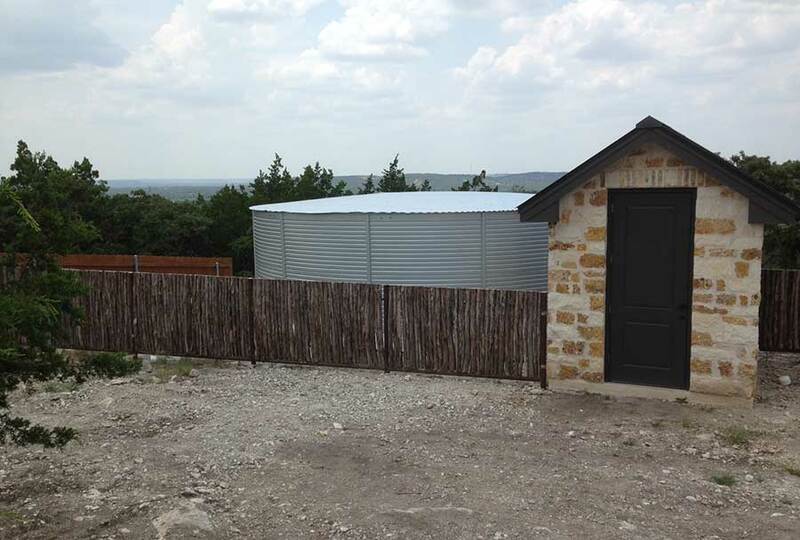 Pioneer Water Tanks are the most sought after tank for domestic water storage. 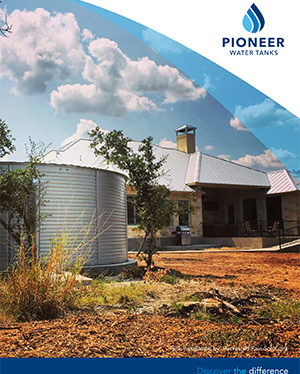 Using a time-tested Australian design, Pioneer Home & Ranch water tanks provide a proven, high-quality design for a wide range domestic uses including rainwater harvesting, well water storage, livestock watering, fire protection, long-term potable water storage and much more. What is most important to our customers is the security of their water supply. Whether the water is needed for the household, for stock watering or for fire protection, water is perhaps the most valuable asset on the land. We cannot live without it. When customers buy a Pioneer Water Tank, they are buying peace of mind. 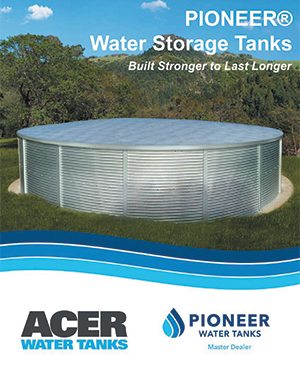 Pioneer Water Tanks are “Built Stronger to Last Longer”. 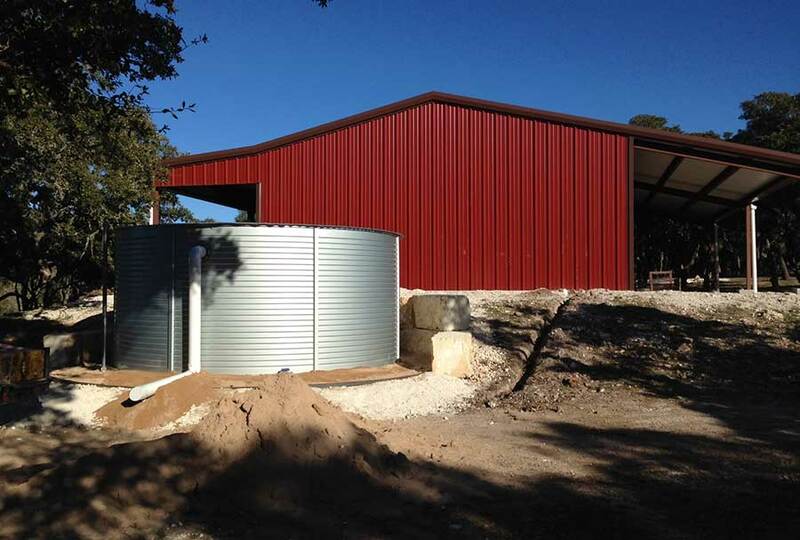 Let the experts at Pioneer Water Tanks assist you with your water storage tank needs. We offer completely BPA-free water tanks that are NSF 61 certified for potable storage. Everything is handled including the design of your water system, delivery, and installation. 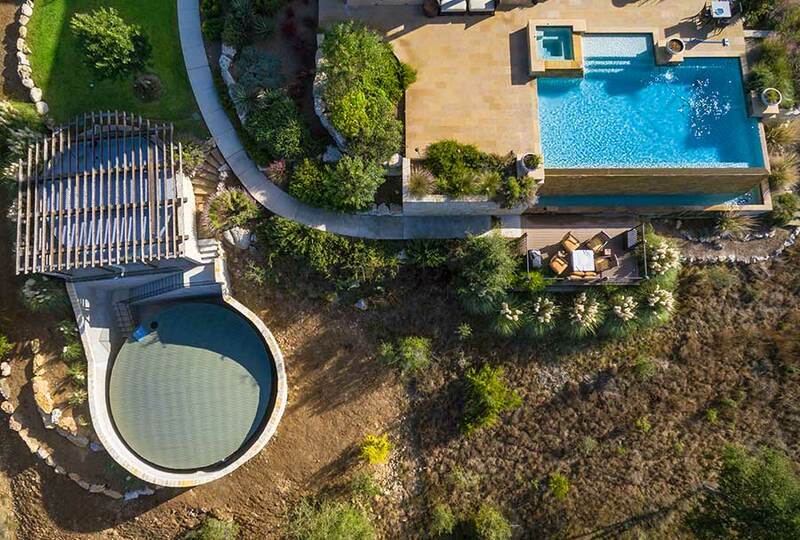 The Aqualiner® is the best liner in the water tank industry, hands-down. Unlike the liners in most water tanks, the Aqualiner® is made from a reinforced fabric with a woven center layer for strength and durability. Although the liner is hidden from sight and often doesn’t get noticed unless there is a problem, we feel that it is perhaps the most important part of the tank which is why only Aqualiner® membranes are used in Pioneer® tanks. 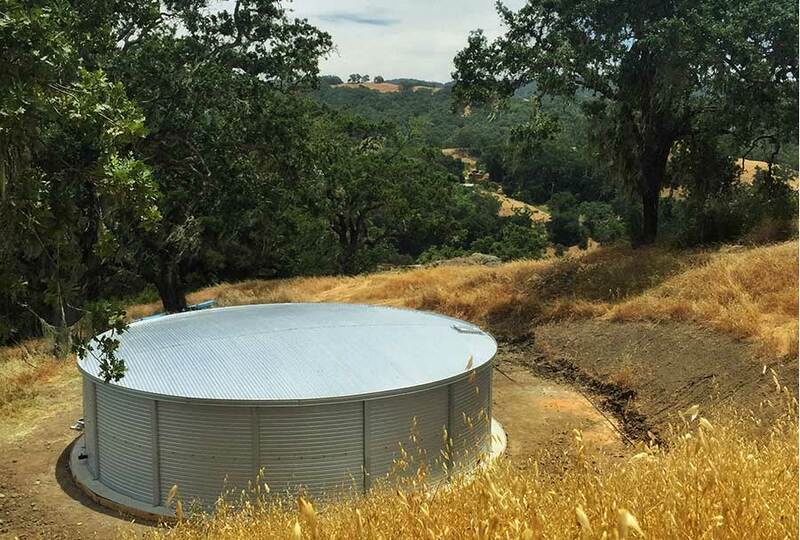 A clear polyethylene film coats both sides of the water tank liner, giving the product NSF 61 approval for the storage of drinking water. The Aqualiner® is well-known for not imparting any taste or smell in the water, so when the quality of your water is paramount, choose Aqualiner®. 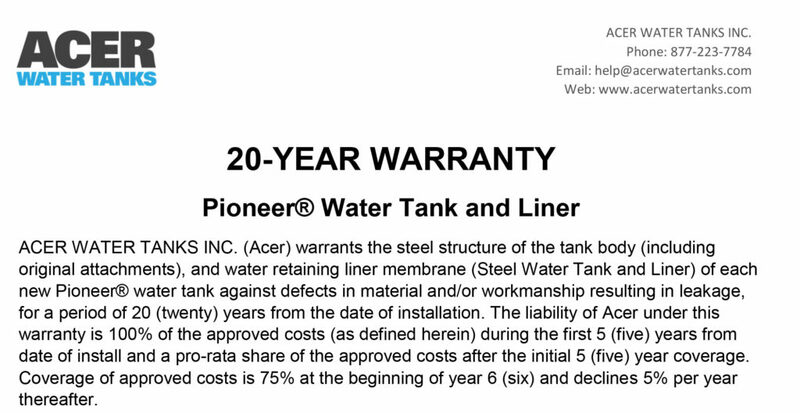 Only the highest quality Zincalume® and Colorbond® steel is used in Pioneer® Water Tanks, providing unmatched durability that no other tank manufacturer can offer- that’s why Pioneer® Tanks last longer than any other brand. Next generation Zincalume® Steel’s patented Activate™ technology introduces magnesium into the aluminum-zinc alloy coating, improving galvanic protection by activating the aluminum. The result is a tougher protective coating that’s more resistant to scratches and scuffs encountered during construction. Proven to outlast galvanized tanks by 200%, according to BlueScope Steel studies, Pioneer Water Tanks are engineered to exceed. 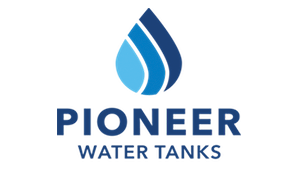 With a standard lifetime of 20 – 25 years, Pioneer Water Tanks include magnesium anodes that are buried underneath the tank to take on corrosion. When these magnesium anodes are replaced every 10 years, the protection continues as corrosion is kept away from the water supply. 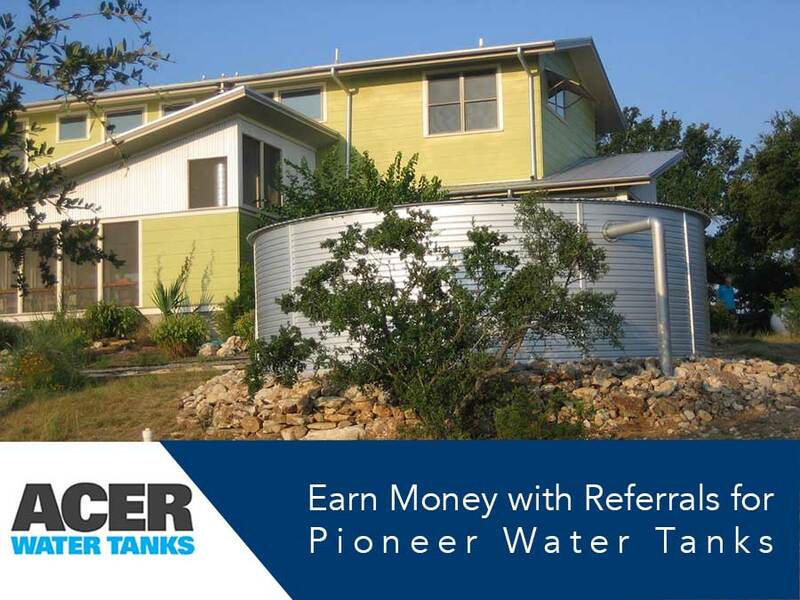 Acer Water Tanks’ Customer Referral Rewards Program is offered for every North American purchase of a Pioneer Water Tank to the original purchaser. Our Referral Rewards PIN can be found on the certificate in the warranty package mailed to you by Acer, an example can be found below. Eligible customers may receive a referral rebate of $500 when they recommend a Pioneer® Water Tank to family and friends, and they purchase a tank using your Referral Rewards PIN. On top of the referral rebate, we also give a $250 rebate to any referred customer that uses a registered Referral Rewards PIN with their purchase. There is no limit to the number of referral rebates that qualified customers can receive; however, there are terms and conditions*. In order to claim your referral rebates, both you and your referral customer must register the purchase PIN online. Referral rebate checks will not be issued until a referral purchase has been properly registered and verified by Acer Water Tanks Inc.
Once referral purchase has been verified, please allow up to 60 days from verification for the Referral rebate check to be processed. Share your PIN with as many of your friends as you like, and tell them how much you love your Pioneer tank! When your referral makes a purchase, instruct them to use the Referral Rewards PIN to claim their purchase online at www.acerwatertanks.com/referral.referral rebates, both you and your referral customer must register the purchase PIN online. Upon verification of your referral’s purchase, Acer Water Tanks will issue a Referral Reward of $500.00 to you, and your referral customer will also get a $250.00 Referral Reward. The National Safety Foundation, NSF, develops public health standards and certification programs to protect drinking water, food, consumer products and the environment worldwide. The NSF 61 drinking water standards were developed by a team of scientists and industry experts as the criteria for potable water system components. Pioneer Water Tanks always use NSF 61 certified Aqualiner® (NSF Certificate 3A240-01) and Industratex® (NSF Certificate 3A240-02) tank liners that are also tested and proven BPA-free. See both of the certifications with NSF. Manufactured by Bartlett, the Aqualiner® and Industratex® tank liners are known as being the longest-lasting in the industry. The Aqualiner® tank liner is included with residential and ranch Pioneer Water Tanks. 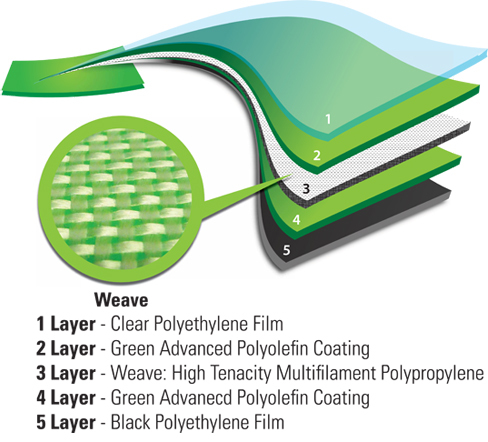 The proprietary tank liner is five layers doubled-welded together with a 65-year lifespan. See the NSF testing for the Aqualiner®. 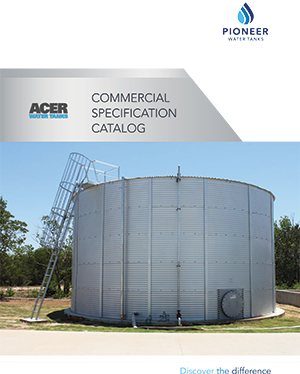 The Industratex® tank liner is included with commercial and large capacity Pioneer Water Tanks.  The unique industrial liner is a double-welded combination of three layers, including a unique polyester weave for strength. The Industratex® has more resistance to various chemicals but it’s recommended to send a chemical analysis report to confirm allowance. See the NSF testing for the Industratex®.